This app automatically organizes the most popular social videos through many social signals and assigns weights to each video. 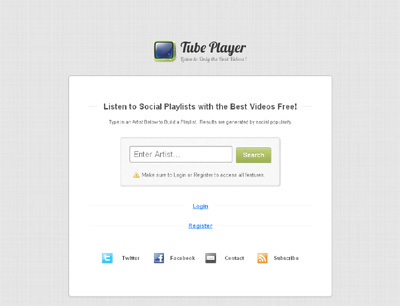 Type in an artist and the software auto generates playlists based upon social quality and auto plays them. Then personalize the playlist by liking or disliking each video. Build an unlimited number of playlists for each artist. When you want to create a shuffle playlist click shuffle and the shuffle feature will store your preferences and create the ultimate personalized list. Since the lists are social and generated at each load, they change over time so they don’t get old and stay fresh. Also, we leverage the sites database of likes and dislikes to increase the accuracy of playlists. All content is watched on Youtube.com through the Youtube API. Our algorithm that generates the playlists only makes the most relevant social decisions. Can save preferences and shuffle playlists too.